Canada vs. Sweden is no longer streaming. This podcast was a labour of love, a true pleasure to produce, and a learning experience. Thank you to everyone who listened, commented and contributed. If you’re interested in episodes, content, or other podcast related things, please contact me. Author RemoteControlHahnPosted on May 12, 2016 November 12, 2017 Categories UndecidedLeave a comment on Thanks for listening! For the language episode I asked you to cast your votes for whether Canada and Sweden are the same or different. Find out which side of the debate won. Also, a call for your help in making the Christmas episode: SWEDES! Please share your Christmas traditions and stories with me by mailing a voice memo to hej@rachelhahn.com. Lastly, I made a little mash-up called “Yes, I am Canadian”. Just my little way to say thanks for listening. When it comes to the delicious and age-old topic of beer, how do Canada and Sweden compare? You’ll hear the tale of a beer-based bromance, find out how much beer Swedes and Canadians drink per capita every year, and get to know the ins and outs of enjoying a frothy alcoholic beverage in each of these fine countries. Interviews feature Mandie Murphy and Austin Roach from Left Field Brewery in Toronto and Thomas Fransson of Malmö Brygghus. 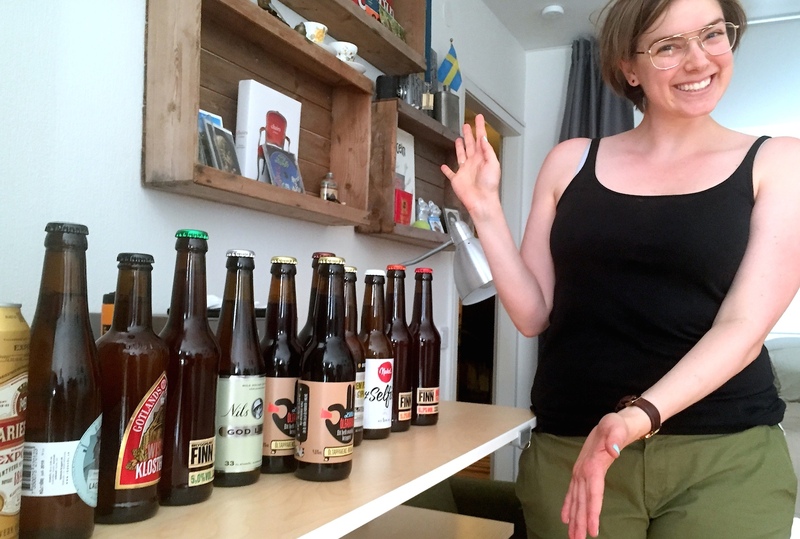 Rachel Cooper presents an array of Swedish beers to be sampled by the Canada versus Sweden panel for episode 02. You can find our podcast on Stitcher, iTunes or stream it from the website right here. If your preferred podcast hub is different than those mentioned above, just search for the RSS feed http://www.canadaversussweden.com/feed/podcast and you’ll get hooked up!